New Zealand feijoas are in the shops here in Queensland but the price is simply too high for me to be cooking… they remain luscious and slightly guilty treats, because of the designer price tags. But I know a lot of you in New Zealand have what I dream of… which is bucket loads of feijoas. Here is a variation on a banana loaf, featured on a blog called baking = love, created by Wellington based foodie Nessie. She has some lovely stories about gathering feijoas all across the country and credits her inspiration to a recipe by Susan Fleischl in A Treasury of New Zealand Baking. If you want a bigger feijoa flavour, swap out the bananas for more feijoa flesh and adjust the ginger depending on whether you’re a ginger lover or not so much. Preheat oven to 170°C. Line two loaf tins. Mix together the mashed feijoa and bananas with lemon juice and set aside. Sift together, flour, ground ginger, salt, baking powder and baking soda. In a separate bowl, beat eggs, sugar, oil and yoghurt until smooth. Fold in sifted flour mixture to the egg mixture. Then fold in the shredded coconut and mashed feijoa, banana lemon mixture. Bake for 60–80 minutes or until a skewer comes out clean. Cool in the tin for 10 minutes before turning out on to a wire rack. Serve cut into thick slices; cold, warm or toasted on a griddle pan. Here’s the recipe for the exquisite cake I enjoyed recently at Hinterland Feijoas… it was perfectly wonderful and Sally knows the secret of baking with feijoas – chop the feijoas a bit on the chunky side so the fruit retains its unique flavour and the feijoa-ness just bursts across your taste buds. If you mash the fruit or cut it too fine, then the other flavours (like the coconut) can take over. It depends what you prefer, of course, but we’re all about the feijoa here. The source of this cake is credited to New Zealand cook and face of the TV show ‘Food in a Minute’ Allyson Gofton, who received it from her friend Shirley. Beat the butter and sugar together until light in colour and creamy in texture. Beat in the egg yolks. Fold in the coconut and sifted dry ingredients with the milk and fruit. Bake at 180ºC for 1 hour or until a cake skewer inserted in the centre comes out clean. Cool for 10 minutes before turning out. Dust with icing sugar before serving or cover with a lemon icing prepared from icing sugar, grated lemon rind and lemon juice. I found the recipe on a fabulous Kiwi foodie blog called Two Spoons but the story about where it originally comes from gets somewhat convoluted. 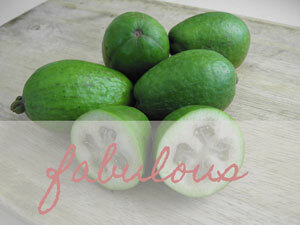 Personally, I think that’s a highly successful recipe, one that is passed fondly from feijoa lover to feijoa lover. Two Spoons has some superb recipes and a long list of New Zealand foodie blogs that is begging to be explored. Be sure to check it out. Preheat oven to 150°C (300°F), arranging a rack in the centre. Heavily grease your springform cake tin, then sprinkle with coconut and flour to prevent sticking. Beat butter and sugar until pale, then beat in yolks one at a time, for a minute after each addition. The mixture should not keep trying to separate before the next step. Add the coconut, and sift over the flour, baking powder and salt. Fold through and when it’s about half done fold the milk and sour cream through as well. Set aside. In a separate bowl, beat the egg whites until they form soft peaks. Fold through the yolky batter until mostly incorporated (a whisper of egg white is ok), then fold through the feijoa. Pop in the oven and let bake 50 minutes to an hour, until a skewer inserted into the centre comes out moist but clean. Cool until warm to the touch, then turn out. On medium low heat, bring the mixture to a bare simmer, until the sugar dissolves, and stir with a whisk constantly to break up any lumps in the cream. Drizzle over cake while warm if possible, and store covered in the fridge for later use. I don’t believe I’ve ever had a gem – we’ve certainly never had gem irons to hand – but the coconut and feijoa combination certainly has my tastebuds tantalised. The recipe comes from the New Zealand Herald. Preheat oven to 200ºC. Put the gem irons in the oven. Sift the flour into the mixture and fold in with the coconut. There’s nothing like a cupcake for a wee snack, if you can stop at one! These coconut flavoured little cakes are topped with slices of feijoa for a dash of flavour. The recipe comes via a blog called Wee Treats by Tammy, an Auckland-based mum, lawyer and foodie. I apologise for the fact that I do not know who Lorna is – I discovered this recipe on the New Zealand Food Lovers website and it sounds divine. Here and there I find people talking about their favourite feijoa and coconut cake and wonder if this is the same recipe, or if there are (probably more likely) a number of variations of the recipe out there. Bake at 180°C for 1 hour or until cooked, putting several layers of newspaper under the tin after about 30 minutes. Cool for 10 minutes before turning out. Heat the oven to 160°C (fan bake). Grease and lightly dust with flour six 1-cup-capacity cake tins. In a bowl, beat the butter and sugar with an electric mixer until pale and creamy. Beat in the eggs, one at a time. Stir in the coconut, sifted flour and baking powder. Spoon the mixture into the prepared tins. Arrange a few feijoa slices over the top of each cake. Cool the cakes in the tins. Once cold, remove from the tins and saturate with hot lemon syrup. To make the syrup, heat all the ingredients in a saucepan until boiling, stirring until the sugar dissolves. Simmer hard for 3 to 5 minutes or until thick and syrupy. I have been dreaming lately of staying at Annandale Manor, an elegant bed and breakfast tucked away – wait for it – on a feijoa plantation in New Zealand!! The romantic 1917 colonial manor is set amidst meandering gardens and four and a half acres of feijoa trees. Their website has a few delicious recipes too, and I am craving the coconut and feijoa cake because I just happen to love coconut as well. Beat the butter and sugar together until creamy. Beat in the egg yolks. Bake at 180°C for 1 hour or until cooked. Cool for 10 minutes before turning out.